We have a webpage up that describes how we go about selecting subcontract PCB suppliers, and offshore suppliers in general. That page probably seems a bit negative, because it focuses on the problems - but it is when there are problems that you really see whether your supplier has value. Of course the whole point is to avoid the problems in the first place, but they do happen. We do actually make PCBs ourselves, as well as subcontracting out the work. There are quite a few small companies in Australia (and no doubt other similar countries) that also do this, I don't think it is widely recognised. There is more give-and-take in the Assembly of PCBs than in the Etching, so I think for the small volumes a little more of the work has remained local rather than going to Asia. As a rule we only make boards as an overall service to customers (ie, if we designed it also) or, as part of our own small products. If you fit that category, we take care of the manufacture. Otherwise, perhaps we can pass on some of our ideas about selecting Board Loaders. Every companies requirement is different, so please take our comments here as opinion based on experience - nothing is incontrovertible. We have used a number of board loaders in Australia - no doubt a similar situation would hold for any country with a similar GDP/Wage structure. The local board loaders are all really quite good - but none, in my opinion, are extremely good. Quotes seem to take a long time here from local suppliers - I think you should allow 2 weeks. The board loaders are facing heavy competition from offshore, and from the general decline in manufacturing locally. I believe they pick their clients carefully - unfortunately our orders, and most of our customers orders, do not seem to be big enough to warrant a close relationship. There has to be Stategy to safeguarding your intellectual property. Government gives you protection, in terms of copyright, trademark and patent. You should use those anyway. But you should also realise that (long term) the protection is only as good the amount you are prepared to spend on lawyers to enforce the patent, especially internationally. Have other strategies in place. This is a self-serving argument, but use ethical design people you trust. You need to own the design, have it done locally under your control. Next, put the product together in an environment where you can control it - have the final product integration done locally, also. This will really cost you a lot of money - there are many savings to be had from manufacturing in China, everything is cheaper, even the cardboard box for shipping the product. Next, have the subunits made by different companies - which is not hard, ofcourse you go to an injection moulder for plastic, and a metalwork company for a baseplate. You could also use different trading names to purchase the materials, and sell the product. It is just a trading name, there is nothing illegal about doing that, and it complicates things for anyone in your supply chain wanting to find out the final sales price. And, to come full circle back to subject, consider if you can afford to use a Local PCB assembly company. In my experience, none of the local board loaders are really that ethical (..long story, irrelevant..) - but they would never steal your design. I do know of instances where that has happened with offshore manufacturers. In reality, you need to think what you are supplying your assembly company with. You also need to be aware of what you say to them. What the board does is irrelevant, that it technically functions and is made correctly is all that matters. Do not listen to offers of assistance to sell in China, as a friend of mine, Fransisco Shi says: "The chinese version of cooperate is 'You buy from me'." What we send to a manufacturer. We would be sending a board with all the references to a PCB number, ie, "Please supply 500 pcs of AB1212458, per attached gerber files and bill of materials". They would know who designed the board (AirBorn - or whoever else you chose). They would know all the parts on the board. They would know, to a degree, what attached to your board, because they could read labels like Solenoid, Coin Mech, Camera on the PCB, or abbreviations on the connectors. Deep down in the files, there would be a short name for the project like "TrigCon". If you have us put other labelling on the board - such as your product name and version - then the assembler can read this also. They would know how many you are buying, and would rightly guess you would be selling the same quantity. Does that constitute enough to be a strategic security threat to your business? It is really for the individual to decide, that is where I leave the subject. Commnunication, Quality, Consistency, Competence. - Wait on, - and Price. What constitutes a great circuit board assembler for one market is a disaster waiting to happen for another. You only need to pull apart a few electronic devices to see there are very different approaches to acheiving the same objective. You can make it reliable, you can make it small, and you can design it on a shoestring, you just can't do that all at once. You have to be able to talk to your assembler, you need feedback. If there is a problem, you want to know about it before it escalates beyond your control. They should have processes in place to provide Quality boards - a good manufacturer will not produce faulty boards, even if you ask them to do it. There are plenty of designer / customer failures that are easily picked up on examination - for instance an orientation not shown on a component. A good manufacturer will go down a list, pick them all up, and bounce them all back to you for repair or explanation. Quality. You want a manufacturer who checks the outgoing work, visually. Then they can apply whatever tests you have offered them as part of the manufacturing. A lack of a visual check is just annoying and downright lazy on the part of a board stuffer. Standards accredition helps a great deal, although, perversely, it guarantees consistency rather than quality. Consistency. We all make boards for the long haul, rarely just once. You do want to know that the second run of boards will be as good as the first, and that any technical info transferred will have been recorded and will be acted upon. Consistency is critical. Competence. The truth is most of the manufacturers out there are pretty good at their job, and if your work is adequately documented by us, they should not have a problem with it. Personally, I do feel a lot more confident after seeing some examples of a manufacturers work, and comparing it in complexity and quality to what the client requires. A visit helps a great deal. Its stating the obvious, really. You start with a good design, then you make quality copies of it - there isn't any other way to do it. It is also about Design for manufacture - designing a board so that it is easy to make. Here in Australia we do not get much of a chance to design Consumer Electronics (see Economies of scale). 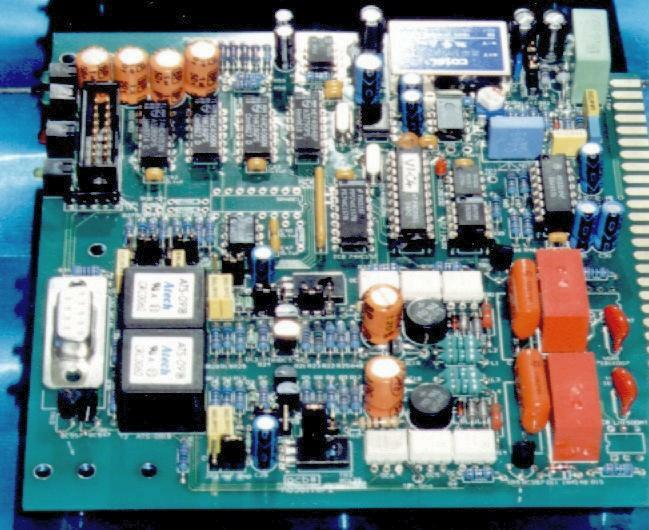 Most of the electronics design work in this country is medical, mining, government work - or specialised Industrial and Commercial electronics. It could be summarised as "professional quality equipment". These customers sell (generally expensive) niche market equipment. (Which is not to say they aren't very conscious of what that equipment costs to make.) They really do not want to have a breakdown caused by a manufacturers decision to use an economical 10c IC socket in place of a more reliable 40c part, or the substitution of a specified chip or FET with a deceptively labelled fake. Other manufacturers, who sell into higher volume commodity-product markets, have different design rules apply to their work - they would question why the socket was even there in the first place. PCB Laminates are professionally manufactured using Fibreglass FR4 stock, soldermask over bare copper (top & bottom), PTH, solderable finish, and silkscreen encoded with a full component identification legend. All connectors are polarised, with numbering clearly marked. All interboard cabling is stranded. All light wire is tinned stranded. Components subject to lowered MTBF due to external adverse factors (e.g. line drivers) are socketed. All socketed components are identified, with orientation shown. All parts used are first grade, new, manufacturers product meeting the full manufacturers specification. All non-substitutable-at-repair components are clearly marked. All parts & PCBs have been processed under anti-static conditions. It is surprising how many standards accredited Manufacturers produce atleast some equipment that complies only with items (8) and (10) - this is because quality of manufacturing starts with the design, if the design did not include (for example) polarised connectors, IS09000 manufacturing certainly could not add it later. Communicating manufacturing information is a critical issue. But it is easily solved - you just need a thorough BOM (= Parts list), and to pay a smidgen extra so that your design people have some budget to talk to the manufacturing people as the project gets underway. The AirBorn approch has been to document clients projects on (generally) password protected webpages, so that the design is easily accessible. This assists greatly. Even though it is largely optional in Australia, unless there is a good reason otherwise (basically defence work) you probably should make your boards ROHS and lead free, it costs no more.